How do I trade IQ Option with the Digital type? 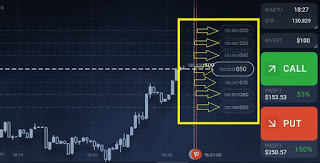 Actually the type of digital trading is not much different from the type of binary option, it's just that to open a trading position on a digital type is affected by the strike price. On this occasion I will share a tutorial on how to use digital options and technical strategies so that profit is always consistent. Starting from how to play digital option trading, to the trick to playing digital IQ Option. Most traders try this type of digital option because it has the potential to have a profit / profit value that is greater than the type of trading binary option. But in conducting analysis and open execution the trading position must be more focused because of the strike price. So when we choose the Call or Put option, the open position will start from the position of the strike price we choose. But the strike price is always changing, even though we are free to choose a strike price, but usually the strike price that has the advantage is the strike price that is changing according to price movements. Before we learn digital option trading strategies, we first discuss how to use or play digital option trading. Usually the strike price which keeps changing following the price movement has a high profit value, compared to the strike price which is far from the current price movement position. Please note that each strike price offers a different value of profit. 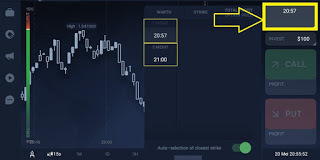 The function of the strike price is to determine the open point of the position whether it is Put or Call as you choose. When executing, the trader must be able to predict whether the price of an asset when the time has expired will be below or above the strike price. As explained above, each strike price has a different advantage. 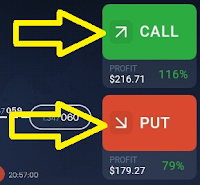 We can see the profit value under the CALL and PUTT buttons. The size of the profit can change, sometimes it rises, sometimes the value decreases. For now the closing time for digital trading is 5 minutes and 1 minute. Sometimes only 5 minutes are closed. So it's important to see the closing time to match your trading analysis. It is recommended to open a position either Call or Put at the strike price which is changing according to price movements. After you have chosen to open a CALL or PUT position, then only need to wait until the closing time. Are the results of profit or loss? That's the tutorial on how to play digital trading options. Then, How do you open the selected position to make profit? You have to learn the trading analysis strategy. 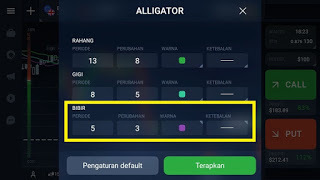 On this occasion I will share the easiest digital trading technique using the Bollinger Bands and Alligator indicators. Before discussing the strategy, we need to know that we will trade at the closing time of 1 minute or 5 minutes. Although sometimes a 1 minute closing time is not available. Now the Bollinger Bands indicator is ready to be used. We will make call and put options when there will be a change in volatility that identifies a trend movement. We will wait for changes from the line of Bollinger bands that were close together starting to widen upwards or downwards. Open a Call position after the appearance of a long bullish candlestick that penetrates the top of the Bollinger bands line. Open the Put position after the appearance of a long bearish candlestick that breaks the bottom of the Bollinger bands. We will open positions when there will be a trend movement both Uptrend and Downtrend. We must wait for the adjacent indicator line to open or widen, because that is a sign of a trend movement. 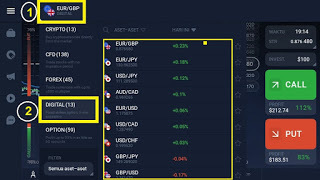 That is the method and strategy of playing a digital option trading type, in which the profit value of the profit can be greater than the type of binary option. Hopefully this article can help you to achieve profit consistently. 0 Response to "The Most Powerful and Sure Profit IQ Option Digital Trading Strategy"